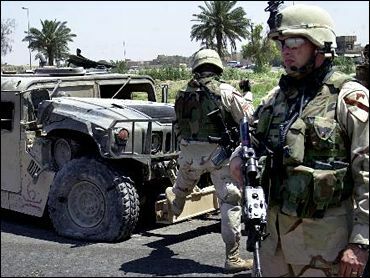 A roadside bomb detonated near a U.S. military convoy in a residential neighborhood in southeast Baghdad on Tuesday and killed three U.S. Marines while wounding two others in the first fatal attack since the sovereignty transfer. A U.S. soldier at the scene said several troops were wounded or killed when the blast hit the lead vehicle. Footage from Associated Press Television News showed blood inside a slightly damaged Humvee and a flak vest laying in the road. Word of the blast came as three Turkish hostages were released by militants in Iraq, the Turkish foreign minister said. "Our citizens have been released," Foreign Minister Abdullah Gul told state television. "We've struggled a lot for their release." Prime Minister Iyad Allawi said Tuesday that Saddam Hussein and up to 11 top detainees will be transferred Wednesday to Iraqi legal custody. Iraqi militants shot dead an American hostage they had held hostage for three months, saying the killing was because of U.S. policy in the Mideast nation, Al-Jazeera television reported Tuesday. The station reported that the slain soldier was Spc. Keith M. Maupin, but the U.S. military said it could not confirm whether a man shown being shot in a murky videotape was indeed Maupin, who was taken hostage after an April 9 attack outside Baghdad. In a separate hostage-taking, the father of a U.S. Marine who was reported kidnapped by militants on Monday issued a plea for his release. The captors of Cpl. Wassef Ali Hassoun have threatened to behead him. Hassoun, an American Marine of Lebanese descent, was shown blindfolded, with a sword brandished over his head in a videotape aired on Al-Jazeera on Sunday. The militants threatened to behead him unless all Iraqis "in occupation jails" are freed. They did not set a timeframe. NATO leaders agreed to help train Iraq's armed forces — a decision that fell short of U.S. hopes that the security alliance would take a larger role in Iraq. In Baghdad, assailants attacked a U.S. patrol in the Azimiya neighborhood. One civilian was killed, according to an official in the Interior Ministry who spoke on condition of anonymity. Early Tuesday, gunmen attacked a police station in Mahmudiyah, 20 miles south of Baghdad, killing one officer and one civilian, said policeman Satar al-Ghareri. Some eyewitnesses said the gunmen recited Quranic verses before peppering the police station with bullets and rocket-propelled grenade-fire. Also Tuesday, a roadside bomb exploded as a senior Kurdish police official was heading to work, killing one of this guards and wounding him, police said. Word of the release of the Turkish men first surfaced in a report on Al-Jazeera television that said an extremist group responsible for beheading two other foreign hostages had announced it was releasing the three Turk hostages "for the sake of their Muslim brothers." The Arab satellite station broadcast a videotape showing the three, believed to have been contractors, kneeling in front of three members of Abu Musab al-Zarqawi's Tawhid and Jihad movement, as one of the militants read a statement. "For the sake of you, our brothers, and Muslims of the people of Turkey ... we will release these hostages and send them safely home," the statement said. Two other Turkish hostages held by militants in Iraq were allowed to call their families to say they would be freed within a week after their company agreed to kidnappers' demands to stop working as a contractor for the U.S. military in Iraq, CNN-Turk television reported. The fathers of the two hostages said in phone interviews Tuesday with the private network that the two hostages — Soner Sercali, an air conditioning repairman, and his co-worker Murat Kizil — were in good health. They have been reported missing since June 1. Sercali's father Feridun said their company, Kayteks, had agreed to stop doing business in Iraq. Neither the company nor the families could be reached for comment Tuesday. The Turkish news agency Ihlas on Monday released a photograph of the two hostages showing them squatting in front of five masked men armed with machine guns and rocket-propelled grenades. The agency said its photographer took the picture at an unspecified location in Iraq. Thousands of Turks work as truck drivers or contractors in Iraq. The kidnapped Turks were accused of working for the U.S. occupiers.